Following their 11-goal exit from the 2017 finals series at the hands of the GWS Giants, West Coast were widely tipped to tumble down the ladder with the loss of over 1000 games of experience after the likes of Matt Priddis, Sam Mitchell, Drew Petrie and Sam Butler all hung up the boots for 2018. 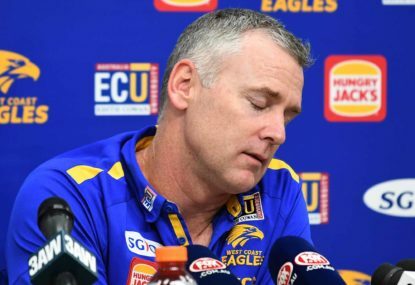 With a redesigned logo and jumper and a brand new stadium, the Eagles were well and truly entering a new era in Adam Simpson’s fifth year at the helm as head coach. With the rights to play the first ever men’s AFL game at Optus Stadium against Sydney, West Coast were on the receiving end of a Lance Franklin masterclass, with ‘Buddy’ booting eight goals as the Swans claimed a 29 point victory. The Eagles regrouped from their first-round loss, defeating the Bulldogs at Marvel Stadium before claiming a come-from-behind victory over the Cats on their home deck. Further wins followed against the struggling Blues, Suns and Dockers, before West Coast proved themselves as a legitimate finals contender, triumphing over Port Adelaide and the Giants. In a top-of-the-table clash with Richmond, the Eagles showed they could match it with the best of the best, cruising to a 47-point win. Their streak of victories extended to ten after they defeated Hawthorn and St Kilda, making it West Coast’s longest run of wins since the 2006 and 2007 seasons. The Eagles returned from their midseason bye with a second meeting against Sydney. West Coast were again unsuccessful against John Longmire’s men, before a shock loss to a resurgent Essendon outfit at Optus Stadium occurred. Despite leading by 20 points at three-quarter-time, the Eagles were felled for a third consecutive week in Round 15 against the Adelaide Crows, with critics starting to question whether West Coast were the real deal or not. A much-needed return to form soon followed and the Eagles won six of their last eight games of the season, with a 40-point loss to North Melbourne and a home defeat at the hands of Melbourne the only bumps on the road. Having finished in second position on the ladder, West Coast locked in a home qualifying final against Collingwood. In front of a monster crowd of 59,585 spectators, the Eagles defied a ten-point deficit at the final break to claim a 16-point victory, sending them through to the preliminary final. Set to take on Melbourne, the same team that conquered the Eagles on their home turf just weeks prior, West Coast made sure to avoid another slip-up, kicking ten goals to nil in a dominant first half to confirm their place in the 2018 grand final against the in-form Magpies. With West Coast’s disappointing performance in the 2015 decider still fresh in the memory, conceding the opening five goals of the match would not have helped the nerves of both the players and fans of the blue and gold. However, in a sensational contest, the Eagles dug deep and slowly but surely fought their way back into the contest, grabbing the lead late in the third quarter after an Elliot Yeo goal. Another strong patch from Collingwood saw West Coast faced with an 11-point deficit early in the final quarter. 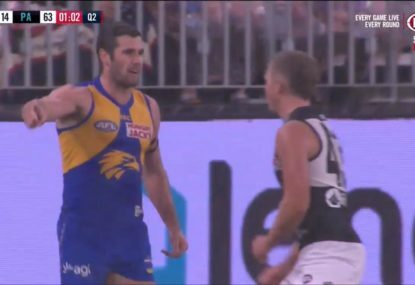 In a dominant but wasteful finish to the game, the Eagles scrounged together the last two goals of the contest, including Dom Sheed’s matchwinner, to claim one of the greatest grand finals in the history of the game. With 34 possessions, nine clearances, eight tackles and a goal, Luke Shuey was a deserving winner of the Norm Smith Medal for his best-on-ground performance. 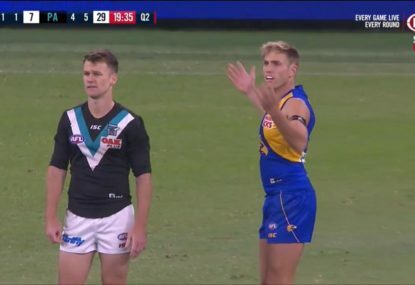 West Coast’s flag will go down in AFL folklore considering the amount of talent not available on the day, which included injured duo Nic Naitanui and Brad Sheppard as well as the suspended Andrew Gaff. Star midfielder Yeo claimed his second consecutive John Worsfold Medal, narrowly defeating Jack Redden and West Coast captain Shannon Hurn. After a decorated career that saw him kick 441 goals, Mark LeCras hung the boots up following the premiership, with the Eagles bidding farewell to the delisted Luke Partington, Malcolm Karpany, Ryan Burrows, Callan England, Tony Olango and Tarir Bayok. 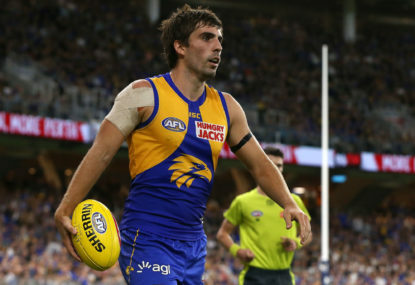 Following a year of fierce speculation, out-of-contract free agent Andrew Gaff sensationally turned his back on a mega-deal from North Melbourne to re-sign with the Eagles. The wingman will be desperate to take West Coast back to the grand final, having missed out due to an eight-game suspension received in the Round 20 Western derby when he struck Fremantle’s Andrew Brayshaw, resulting in a broken jaw and dislodged teeth. 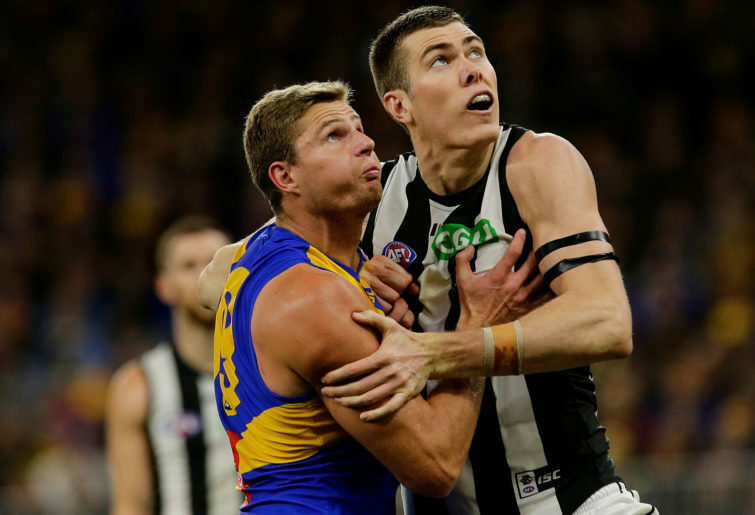 Despite Gaff agreeing to a new deal with the club, West Coast were not so lucky when it came to Scott Lycett’s future at the club, with the premiership ruckman departing to Port Adelaide as a free agent. Needing to boost their ruck stocks as a result, the Eagles targeted St Kilda’s Tom Hickey, giving up pick 39 and a future fourth-round selection in exchange for the 27-year-old, pick 61 and St Kilda’s future fourth-round selection. Despite first-year sensation Tim Kelly seeking a trade from Geelong to West Coast, nothing would eventuate, with the Eagles set to gain his signature at the end of 2019 provided he doesn’t have a change of heart. Due to live trading being available at the national draft for the first time ever, West Coast’s first pick didn’t come until selection 28, when they took Xavier O’Neill from the Oakleigh Chargers. Luke Foley from Subiaco joined a few picks later, with Bailey Williams and Next Generation Academy member Jarrod Cameron also picked up. In the rookie draft the Eagles selected Harry Edwards from Swan Districts before handing former Magpie Josh Smith a lifeline. Ex-basketballers Patrick Bines and Brodie Riach were also picked up as category B rookies, with former Gold Coast ruckman Keegan Brooksby added to the rookie list as per the AFL’s new preseason supplemental rules. Another year, another sensational campaign for West Coast defender Jeremy McGovern, who managed a third consecutive All Australian appearance to go with his premiership medal. McGovern was the story of grand final week, having to overcome internal bleeding and torn muscles in his hip region after a heavy collision in the preliminary final against Melbourne. 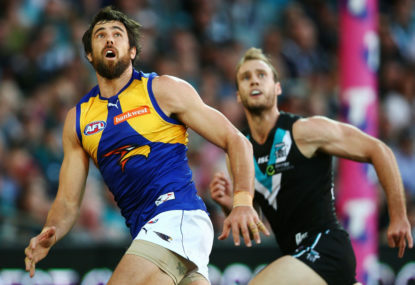 Having barely trained in the lead-up to the decider, McGovern took his place and, despite breaking his ribs during the match, helped set up the winning goal from Dom Sheed with a courageous intercept mark in the final minutes. It was one of nine grabs that McGovern managed, helping settle an Eagles defence that was under extreme pressure early in the game after Collingwood’s initial onslaught. Having broken the record for the most intercept marks in a single season last year, McGovern enters 2019 well and truly in the prime of a glittering career. Up the other end of the field it was a frustrating year for two-time Coleman Medallist Josh Kennedy, although it had a wonderful end for the former Blue. 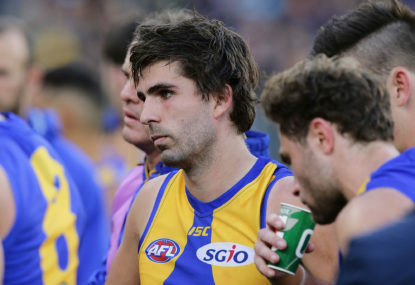 Having missed the opening three games of the season due to his rehabilitation from ankle surgery, Kennedy returned to form a lethal one-two partnership with Jack Darling up forward. 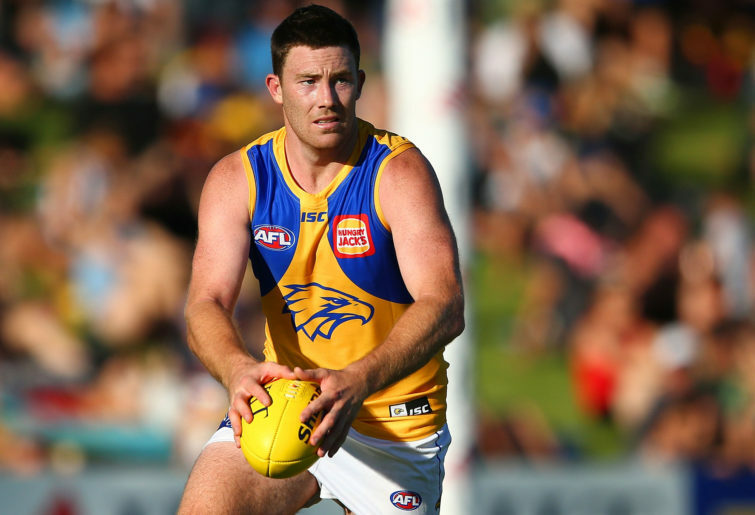 However, a shin injury sustained in West Coast’s loss to Sydney in Round 13 would ultimately cost Kennedy a large portion of his year, with the 31-year-old returning in time for the Eagles’ finals campaign. In a strong grand final performance, Kennedy was West Coast’s most potent forward on the day, collecting 18 disposals, hauling in 11 marks and booting three goals. Despite appearing just 14 times during the season, Kennedy still managed 43 goals. If he can get on the park more regularly in 2019, the Eagles have a terrific chance of going back-to-back for the first time in club history. Having spent majority of his career to date on the sidelines due to an unreliable body, it was not a shock when Nathan Vardy suffered a groin injury heading into the 2018 campaign, ruling him out for the opening half of the season. With Nic Naitanui and Scott Lycett forming a formidable ruck partnership, Vardy had to bide his time before he could return to the senior line-up. In one of the biggest sliding doors moments of the season, the unfortunate knee injury to Naitanui in Round 17 against the Magpies would give Vardy the opportunity to move back into the side. The former Cat played the final nine games of the season, with his best performance arguably in the grand final, where he kicked a crucial final quarter goal. With Naitanui not due to return until mid-season and Lycett now at Port Adelaide, it is up to Vardy to shoulder the load as the Eagles begin their premiership defence. 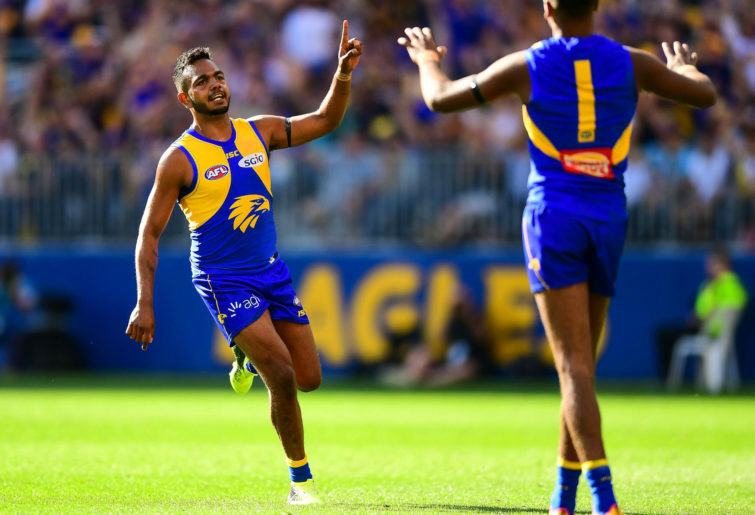 Having shed over 15 kilograms in a bid to start his career with the Eagles, Willie Rioli enjoyed a standout debut season in 2018, missing just one match as he booted 28 goals, including West Coast’s first in the grand final. Rioli worked tirelessly against opposition backlines, fighting tooth and nail to keep the ball locked inside the Eagles’ forward 50, averaging 2.6 tackles a game. Late in the season Adam Simpson started experimenting by throwing Rioli into the middle of the ground, where his hard attack on the ball and his silky skills could be used to great effect. In fact the 23-year-old was injected into the middle for the final centre bounce of the grand final following Dom Sheed’s goal, highlighting Simpson’s faith in the cousin of Cyril. Having streamlined his body even more so over the off-season, watch for Rioli to have an even greater impact in 2019. Remarkably, despite West Coast spending majority of the season inside the top two on the ladder, the Eagles blooded eight debutants for the season, equal-first of any club in the AFL for 2018. With the likes of Jarrod Brander, Oscar Allen, Willie Rioli and Daniel Venables announcing themselves as potential guns of the future, it has seen the likes of Luke Partington and Malcolm Karpany fall completely off the pecking order, with both axed at the conclusion of the season. For Kurt Mutimer, it is a fate he will be desperate to avoid as he comes out of contract at the end of 2019. The Victorian-born midfielder has played just four games since he was drafted in 2015, with no senior appearances coming last season. The 21-year-old has a big task on his hands to convince West Coast list manager Brady Rawlings that he deserves a spot on the list going into the future. Unable to follow on from his career-best season in 2016 with St Kilda, Tom Hickey will be a valuable back-up option for Nathan Vardy as Nic Naitanui continues his rehabilitation from his second ACL injury. The soon-to-be 28-year-old is very versatile and can cover the ground well but has struggled in the last two years, playing just 18 of a possible 44 matches. It is a similar story for Josh Smith, who will add to West Coast’s midfield depth after being picked up in the rookie draft. The former Magpie, who played 31 games in his first two years on the list, managed just one appearance in 2018, but having won the Eagles’ yo-yo test at training last month, the 25-year-old has done his chances of adding to his tally no harm. With Josh Kennedy coming to the end of a highly decorated career, the Eagles set out to find a suitable replacement at the 2017 national draft. At pick 13, young Victorian tall Jarrod Brander was selected by West Coast, with the 195-centimetre utility capable of playing at either end of the field. A childhood supporter of the Eagles, Brander put an extra two years on his contract before he even played his first game, which came in Round 13 against the Swans. This shows the amount of faith the West Coast list management team have in the youngster, and the 20-year-old will be out to repay that in 2019. Another high-quality young tall gunning for a long-term spot in West Coast’s senior outfit is WA-born Oscar Allen. Having won the Larke Medal as the standout player in the national Under 18 Championships in 2017, Allen joined the Eagles via selection 21. In his debut season the teenager played two matches, in which he was used at both ends of the ground. With Brander expected to hold down the fort up forward in the future, there’s every possibility Allen could be making a name for himself up the other end of the field. One of West Coast’s most dynamic players, Elliot Yeo capped off a superb year by winning yet another John Worsfold Medal, his second in a row, while he was unlucky not to make back-to-back All Australian appearances. The former Lion averaged a career-high 24.6 possessions, 6.7 tackles and 4.3 clearances, with these numbers making him one of the most valuable Supercoach players in the league. At an average of 107.9 points per match, Yeo displayed terrific consistency, posting 15 scores above 100 points. There is every chance Yeo has another level in his game that he is yet to reach, and it is a scary proposition for the opposition if so. View the full 2019 AFL fixture here. Due to their grand final victory, West Coast have received a challenging draw for the 2019 season. The Eagles will play top-four sides Collingwood and Melbourne twice, while return matches against Adelaide and Hawthorn will prove quite tricky. As usual, West Coast will also take on fierce rivals Fremantle twice. The Eagles will play 12 matches at Optus Stadium, a venue they won 11 out of a possible 14 times at in 2018. Six games will be played in Melbourne, with three at the MCG, two at Marvel Stadium and one down in Geelong. They will also play one match apiece at the Gabba, SCG and Adelaide Oval, with a game against Melbourne in Alice Springs also scheduled. For the first time ever West Coast will play on Good Friday, with the AFL fixturing a home game against Port Adelaide to follow North Melbourne’s clash with Essendon that afternoon in Melbourne. It is one of four marquee matches that the Eagles will participate in during 2019, with two home Friday night clashes and a Thursday night game in Perth slated. West Coast will return to play a match at Kardinia Park for the first time in three years in Round 6 when they take on the Cats, while their clash with Carlton in Round 20 will be their first meeting under the roof at Marvel Stadium since 2014. Finally, the Eagles will make history in Round 18 when they take on Melbourne at TIO Traeger Park. It will be the first time ever that West Coast will play a game for premiership points in Alice Springs. Strangely, the AFL have scheduled West Coast’s first home match of 2019 against the GWS Giants on a Saturday night in Round 2. While the Eagles won’t get to unfurl the premiership flag against the Magpies, the team they requested for their first home game, it still promises to be a special night for all wearing the blue and gold. If everything goes to plan, captain Shannon Hurn will notch up his 250th game, while durable midfielder Chris Masten should celebrate his 200 game milestone. If you’re a West Coast fan, make sure you get a ticket to this one. Despite going into the season as the reigning premiers, there will be some games on the 2019 calendar that will have West Coast fans nervous. In Round 6 the Eagles will take on the Cats at GMHBA Stadium, a venue they have lost their last six games at by an average of 60.2 points. Round 12’s match-up with Sydney will give the Eagles a chance to win their first match at the SCG since 1999, while a few weeks later Adam Simpson and his men will be hoping to break a 13-year drought against Hawthorn at the MCG. I am a massive fan of how the West Coast Eagles go about their footy. Adam Simpson has his side playing a terrific brand of football with gun players on every line. And that isn’t even counting Brad Sheppard, Andrew Gaff and Nic Naitanui, who all missed the Eagles’ thrilling premiership win. With their return, West Coast have every chance to mount a case for back-to-back flags, something that hasn’t been achieved by a non-Victorian side since the Brisbane Lions in the early 2000s. If the Eagles can manage a top-two finish, thus locking in a home qualifying final, you can almost expect to see them there again on the last day in September. Predicted finish: First to fourth.